When Dan Hunter and Jason Knowles asked me what my all-time favorite horror film is, or rather, the one that had the biggest impact on me growing up, I spent the first couple of weeks just thinking about how hard it's going to be...picking one out of dozens of incredible movies that influenced me when I was young. Everything from Psycho to Jaws came to mind. However, after much deliberation, I kept going back to something that I started watching when I was six years old. The Twilight Zone. The television series. Now I'm not sure if this qualifies as a "horror film" and admittedly, the series was probably more of a science-fiction anthology than it was horror, but it certainly had elements of fear in it throughout. Since the title of this piece is Reflections...on Fear, I feel it's appropriate. The fun would all begin on Friday night at 9:30 pm. It was the end of the school week, I could sleep in on Saturday, and most importantly, it was "Friday Night Fright Night" starting with Alfred Hitchcock Presents from 9:30 to 10:30, and then, the best for last, Twilight Zone from 10:30 to 11:00. Armed with my Dr. Pepper and Frito's corn chips, I would anxiously wait for Alfred (in all his corpulence) to walk in and start the ball rolling with “Good Evening". From there, he would deliver his prologue in a very much tongue-in-cheek, almost comical way, as if to say to the audience, "You poor buggers have no idea what you're getting yourselves into." 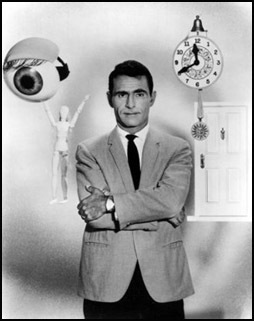 Rod Serling, on the other hand, delivered his eloquent narrative off-screen as a voice-over. He spoke in a very Dragnet-like, matter-of-fact tone as he visually showed us the characters, settings, etc. and verbally described them. Near the very end of his introduction, the camera would pan away from a long shot, revealing Mr. Serling (usually smoking a cigarette) standing there the whole time. I was, and still am intrigued by the way he did this for several reasons. On the one hand, it made him an onlooker like us (the audience) and gave us the sense that he was watching everything very much for the first time just like us. Conversely, it physically put him into the story as a player in a strange way, although he was never actually IN any of the stories. It gave us the sense that he was responsible for and somehow controlling the outcome of the events that were to unfold. Exactly why was The Twilight Zone so good? 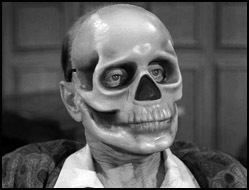 Well, the stories and scripts were superbly conceived, and Rod Serling could scare us in half the time that Alfred did. And the shows were in black-and-white, making it seem more surreal than I think they would have been in color. But really, I'd have to say it was the music. From the famous Twilight Zone opening theme (conceived by Marius Constant) down to each and every musical cue in the episode, it was so perfectly married to the individual story, in a very understated way. The music never "hit you over the head" but rather, accented and punctuated the sheer insanity of the various situations. The composer's use of tonality and orchestral colors was truly unique for the period (1959 into the early Sixties). Don't forget, they didn't have synthesizers, samplers, digital effects, etc. back then. Electronic music was primitive, clumsy, and still in its experimental stage. Instead, he used acoustic instruments playing dissonant chords and intervals. The scoring techniques and sounds were as original as the scripts and stories themselves. For me, it was the Perfect Storm. By design, the audience never saw anyone's head cut off, throats slashed or bodies impaled. But the terror from the unexpected, and sometimes macabre, twist at the end would scare the hell out of me every time and leave me thinking about that half-hour experience (minus the annoying commercials) for weeks on end. Over the years, I learned to use the commercial breaks to my advantage to do things like grab another Dr. Pepper, or go to the bathroom without having to miss one precious second of my favorite show. 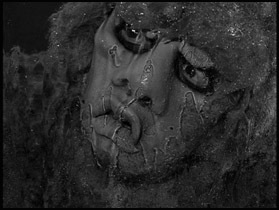 So it's eleven o'clock and another Twilight Zone episode is over. I now have all week to reflect on what I experienced that Friday night as I wait in fearful anticipation for next week's "Fright Night" adventure to find out what Mr. Serling is going to do to my scared, pathetic little mind.